Cedar is a naturally attractive wood that ages over time into a beautiful grayish silver color. 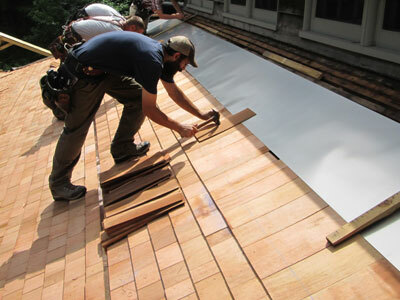 Cedar lasts at least 10 years longer than other roofing materials, such as asphalt. Cedar wood shingles and shakes can stand up to harsh New England weather, such as hurricanes, strong winds, heavy rains, and snowstorms. Cedar wood roofs provide up to twice the amount of insulation as asphalt shingles. This can significantly reduce your heating and cooling costs throughout the year. Cedar roofing does cost more than other types of roofing, and it requires more maintenance to prevent the growth of moss, mold, and mildew. The cedar can be treated to protect the wood from damage. For many homeowners, the advantages far outweigh the disadvantages. Certi-Split shakes have a rough split face and sawn back. These cedar shakes are a popular choice for traditional, ranch, or vacation homes or for non-residential buildings. They blend well with natural or rustic surroundings. Certi-Sawn red cedar shakes are sawn on both faces but are thicker than shingles, which lowers application costs. These shakes have a more defined shadowline than other shakes. Certi-Ridge shakes are pre-manufactured caps for hips and ridges made from the same red cedar as Certi-Label shingles and shakes. Certi-Grade shingles are smooth sawn and architecturally uniform. They are chosen for both traditional and modern homes and commercial buildings due to their natural and tailored appearance. At K.P. LaMarco & Associates, we install and repair cedar shake and shingle roofs using high-quality materials and expert workmanship. Call us today at (203) 415-6773 to learn more about the advantages of installing a cedar roof on your home or business and to get a no-obligation estimate.